The master oscillator, a voltage reference and comparator collected on DA2. External elements DD1 and DD2 repeated internal structure of the TL494, in the part that works is unstable at low frequencies (false positive D-flip-flop). Further, using the low-pass filter suppresses the upper harmonics of the PWM. LPF consists of two parts. First-DA1.1, with a smooth lowpass characteristic curves. Second-DA1.2 notch filter with a frequency of 150 Hz suppression. The analysis shows that the PWM contains only odd harmonics of the first and, because such a filter is enough to form a “beautiful” sine (oscillogram 2). And, as the level of the first harmonic is almost linearly dependent on porosity, we obtain a well-managed with precision sine constant component equal to 2.5 V. Further, in addition we get the inverse sine (Pin 14 DA1.4). In DA3, DA5, VT1, VT2 assembled the first channel of the VLF class D. The second channel, respectively, collected on DA4, DA7, VT3, VT4. At the output of the first and second channels are formed antiphase sine wave VLF (oscillogram 3). The output of the transformer, a diode bridge fed on the feedback output voltage. Thus the output voltage stabilisator. Related Post "12/220V Converter With Sine Output"
I am from AUSTRIA, please excuse my English. 3 questions: 1. HIP 6601 is difficult to buy, are other IC’s usable? 2. I have troubles to define a detail in the circuit drawing, are R22 and R24 variable resistors with connection to the ground ( Connection R22/R23 respectively R24/R25)? 3. What is the purpose of the a.m. variable resistors? Go to http://www.wakeafrica.com/electronics-projects and see the diagrams. 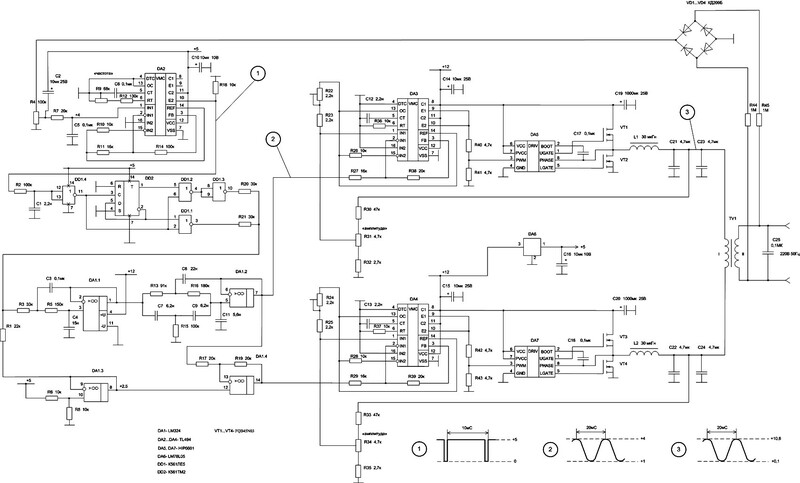 Main disadvantage of such schematics is a huge low-frequency transformer, main advantage is a reliability (provided the device is developed correctly).